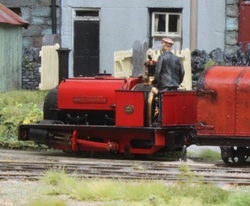 King of the Scarlets - Hunslet 0-4-0ST Agenoria Kit built by Jonathan Mathews. At the time the model was built the prototype was languishing as a rusting hulk on the other-side of the pond. She has now returned to Wales and is being restored in Boston Lodge. Hopefully the newly restored loco will not shame my model! 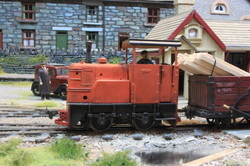 'Dryw' - Kerr Stuart Wren 0-4-0ST Dryw (Welsh for Wren) is one of Marl Clark's Locos & Stuff kits. It was built by Mark, expertly weathered bu Chris Clark (no relation - as far as I know) with nameplates from Narrow Planet. She is a delightful little loco and runs as good as she looks! 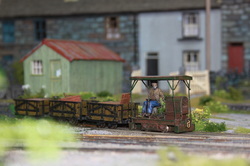 Sybil is the Wrightlines kit and expertly built (as usual) by Brian Love. The prototype was built in 1906 and worked at Dinorwic; she survives and is being restored to run on the West Lancs. Railway. 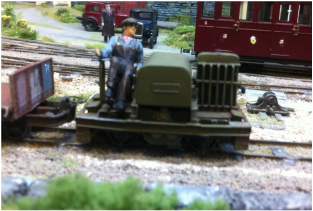 Deutz OMZ 0-4-0DM ' EVA' - This is the SRB kit of the well known German workhorse built between the wars. It had been so long since I actually built a loco I decided to have a go at this one, finished in the state I remember seeing one while on holiday in France. It is a credit to Stuart Brewer, the kit designer, that it has turned out so well. Fowler Marshall 4w petrol. This is the Wrightlines kit. It was acquired second-hand but was an indifferent runner. Investigation showed only one axle was being driven. A little filing and a couple of thrust washers solved the problem and she is now often used as the yard. 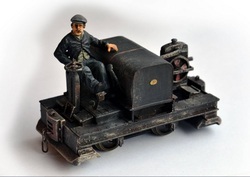 Lister Railtruck - The Flying Bedstead - The Roy Link kit bought from e-bay. I have always had a soft spot for thiese locos, one of the few narrow gauge locos I have actually driven. 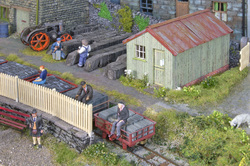 The model plunged to the floor while making a guest appearance on another layout at ModelRail Scotland and has been 'delicate' ever since! 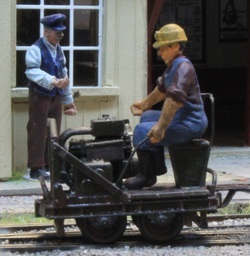 40hp Open Simplex - The Wrightlines kit acquired from the builder, Charles Benedetto of Lewes, who used to trade as Scalecraft. 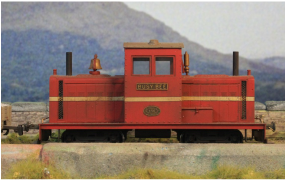 Ruston LAT - The KB Scale kit, Another loco acquired from Charles Benedetto. Struver Schienenkuli. Couldn't resist this. I found it 'Engineer's' pages on Shapeways. Brian and I pondered how we could motorise it but discretion being the better part and all that we decided not to. 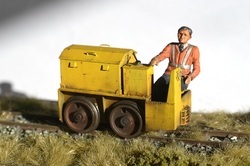 The loco now runs with a Beer Wagon made from an ex-WW1 A class 4w wagon (another 3D print) hiding a small BullAnt chassis. Cheating but fun! 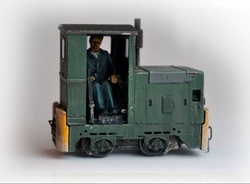 20hp Simplex - These small locos were built by Motor Rail for the British Army - and used extensively in industry after the First World War. 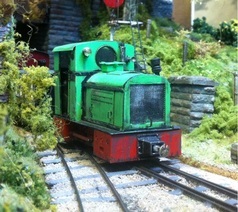 This is the Nigel Lawton kit, kindly built for me by Paul Lindsay Scott - and the radiator fan does work. The Gravity Train - here because there was nowhere else to put it. 7mm NGA etched brass kits, with the smallest BullAnt chassis is one of them. Always runs downhill (otherwise, it would be an anti-gravity train!). Must build some empties for the return working. 'Bernrsen' - freelance centre-cab Bo-Bo diesel built by Paul Berntsen and based on a regauged Bachman HO chassis, Annoyingly she is a delightful runner and is often to be seen on the layout when we don't have proper railway modellers as visitors!